They may look tough and gruff, but Staffies are softies! In fact, Staffordshire Bull Terriers are known in their home country as nanny dogs. They are medium-sized, intelligent dogs who are loving and courageous. They’re a pretty active breed that should get daily exercise along with the great dog food. What is the best dog food for Staffordshire Bull Terriers? Coming all the way from New Zealand is this relatively new (at least for US dog owners) dog food brand that makes such unbelievably good food! This, I can definitely say, is the best food for Staffordshire Bull Terrier pets. Since staffies should be fed a grain-free diet of high-quality ingredients, you can’t go wrong with this food from Ziwi. In this blend, the main protein comes from free range grass-fed venison. All the ingredients in all varieties of Ziwi dog food are all sustainably farmed and free of preservatives that can be bad for your dog. This food from Ziwi is top of the top, but it is also pricey. Keep reading for a slightly less expensive alternative. Another of the best dry dog food for Staffordshire Bull Terriers is this alternative to Ziwi that also comes from New Zealand. Their formulas all have no grain, potato, tapioca, glutens or other plant protein concentrates. All of these things would be filler in a dog food. 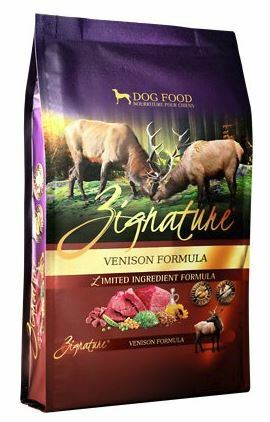 The protein in this food comes mostly from venison, but Zignature also has variants with other protein sources such as the typical lamb, trout, and pork, to the more exotic kangaroo. And they're all pretty awesome too, and all very good for your dog. Vegetables and fruits are included among the ingredients to provide good carbs, antioxidants, and fibers. 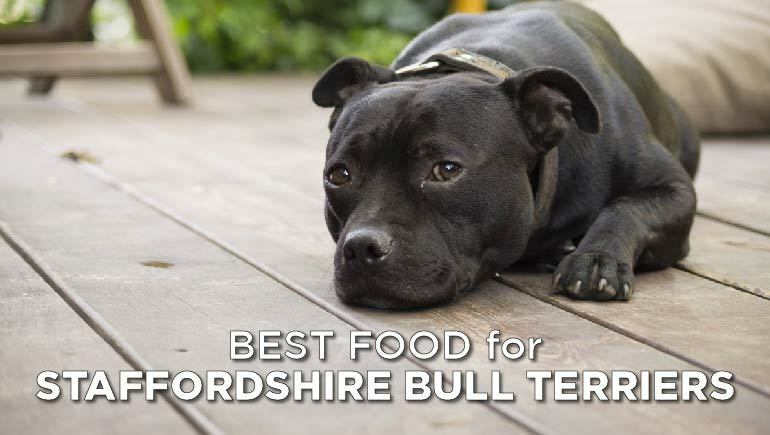 While not the very best food to feed Staffordshire Bull Terrier dogs, it’s certainly near the top, and it’s a more accessible and affordable option for many dog owners. 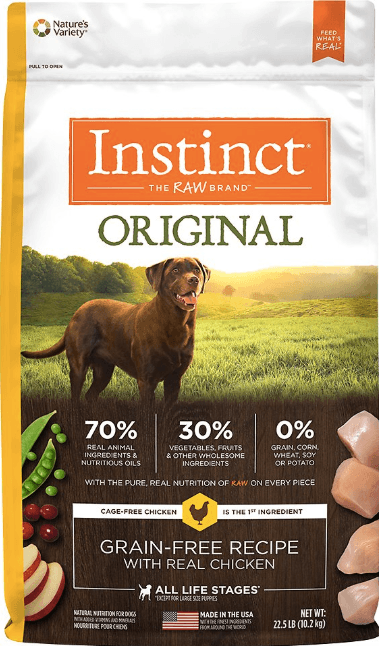 Nature’s Variety Instinct line makes foods with high-quality proteins and no grains so that your dogs are getting nutrition that works with, not against, their digestive system. This formula is grain- and gluten-free formula. It also has no artificial colors, flavors, or preservatives. No corn, soy, or wheat are ingredients. The proteins and fats are all from a single source, chicken, in various forms including real chicken, chicken meal, chicken fat, and chicken eggs. The blend also has probiotics to support good digestive health. 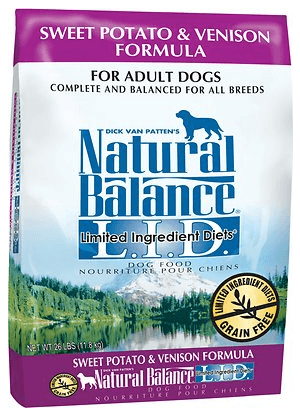 The best food for staffies that suffer from food allergies is a limited ingredient blend from Natural Balance. Every food in this line uses limited protein and fat sources from one type of animal to prevent any digestive upset or allergic reactions that can be common. This particular blend has venison as the main sources of protein, with canola oil and flaxseed as sources of fat. Sweet potatoes, not a protein, are the first ingredient in this food, but I think that can be useful for dogs that are unable to handle a lot of protein, and they’re an excellent source of carbohydrates. Overall, this is a great food. 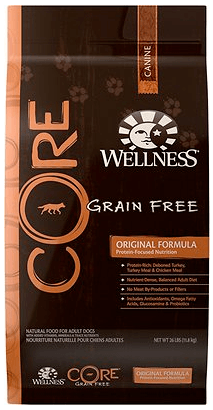 The last food on this list of the best dry dog food for staffies is from Wellness CORE. This is a brand that I appreciate for having good grain-free options that many people love to feed their dogs. They are pretty serious about keeping fillers and byproducts from the food they provide your pet. The original formula has turkey and chicken as the main sources of protein with chicken fat added. You'd also love that this formula has glucosamine which is really great for your dog because it'll keep those staffie joints well-lubricated and healthy. 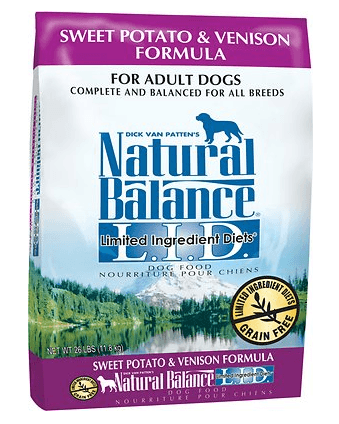 The best food for a Staffordshire Bull Terrier is simply a balanced diet with high-quality ingredients. Staffies don’t have specific needs regarding a diet that need to be met, so you just need to make sure it’s good food that is well-balanced and is free of preservatives and colorings. This undemanding dog can, however, suffer from food allergies. Because of this, you’re best feeding a grain-free diet because grain products are known to worsen allergies. In some cases, it’s believed that a grain diet can lead to new allergies, so it’s best to avoid them altogether. Another thing I’d like to note is that staffies, like other terriers, are at risk for bloat. You should prevent them from eating or drinking for an hour after they exercise vigorously to lower the risk of this condition occurring. You should also keep them from drinking too much water at one time. I hope you found the best dog food for Staffordshire Bull Terriers like yours. As long as you choose a grain-free brand that is made with quality ingredients, you will not wind up with health problems caused by low-quality foods.